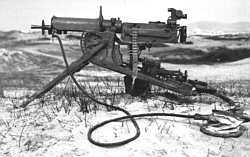 Water cooled British Vickers machine gun. Approx 500 rounds per minute. The gun could be broken down into two pieces for transport. British motorized machine gun battery near the Somme. Water cooled German Maxim machine gun. Same rpm as Vickers. This weapon accounted for 90% of the British casualties on the opening day of the Somme Offensive, 1-Jul-1916. German Machineengewehr 08 (Maxim). Designed by American Hiram Maxim and manufactured in Spandau, Germany. The Germans had 12,500 of these killers in 1914 as compared to the several hundred Vickers of the British army. The Germans would produce over 100,000 Maxims during the war. First weight is gun weight followed by accessory type and weight. Thanks to Robert Segel for these numbers.